Shawn Hessinger: Bing Tagging Can Make Your Website It! You've probably read that Bing is gaining ever so slowly on Google in the overall share of the search market. 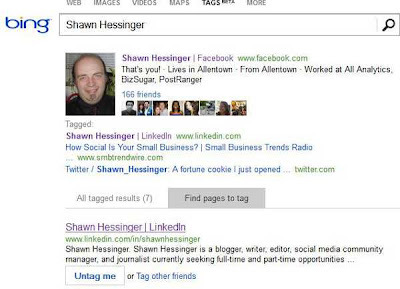 A new feature on Bing can help you improve search results on this increasingly popular search engine by harnessing the social features of Facebook. Here's how! This will take literally only minutes, and once done, you'll have an account from Microsoft, the company behind the Bing search engine, allowing you to "tag" links in the search results coming up under your name. But, in addition, you can also tag links for your Facebook friends, making it easier for them to locate their own content, and your good deed will be recorded in the "recent activity" section of your life stream for your friends to see. And, just in case you get sick and tired of all this do-gooding and want to do some good old fashioned bragging again, well, the new Bing social feature has a way to do that too. My two cents? 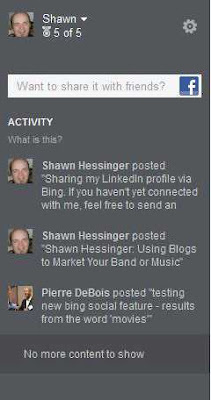 The Bing tagging feature is a neat tool to use for sharing links on the newer search engine with your Facebook friends, and since Facebook has more users than Google+ at present, we can reasonably say there is more opportunity to share links with a potentially larger audience than on any comparable feature Google might offer. That said, the fact is, Google has a much larger share of overall search, so the tool is much more useful as a way to promote your links and those of your friends and business partners to your Facebook connections than it is as a way of appreciably increasing your search traffic through social engagement. Like other tools, this can become a bit of a time sink with limited returns (until Bing gets bigger.) Use it sparingly. 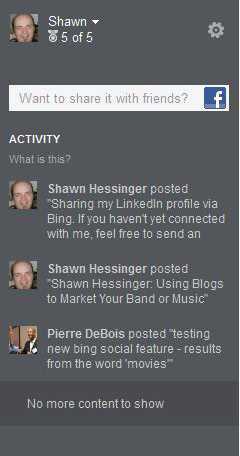 Have you used the Bing tagging function, yet? Tell us what you think in the comment section below! It's pretty cool...what you're doing. Keep teaching us how to use Bing.